Today that form of historical revisionism popularly called “Holocaust denial” abounds worldwide in all its full foul flourish—disseminated not only on Arab streets but in American university newspapers, not only in books, articles, and speeches but in mosques and over the Internet. Can we reject spurious revisionism, or punish purposeful expressions of hatred, and still pay homage to the liberty of thought ennobled by the First Amendment? Are some conflicts between freedom of expression and civility as insoluble as they are inevitable? Can history ever be proven as Truth? This article attempts to answer those questions. 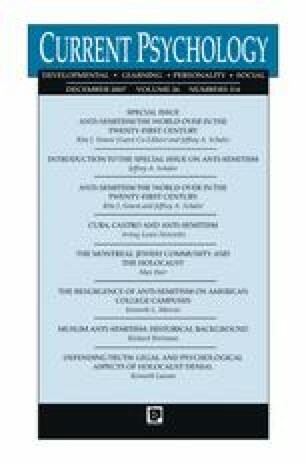 Part I describes the background and nature of Holocaust denial, tracing the Nazis’ adoption of a plan for the “Final Solution of the Jewish Problem” through the post-War Nuremberg Trials to the present day. Part II examines the tension between free speech and historical revisionism, presenting various arguments in deference to principles of liberty and opposed to group defamation. Part III addresses the quest for truth in a free society, including psychological and geopolitical analyses of denial and anti-Semitism. Earlier analyses of this topic appeared in part in the Baltimore Jewish Times (April 13, 2007) and in 6 Geo. Mason L. Rev. 35 (1997).